Eagle Rock is located on the West Shore of Lake Tahoe adjacent to Blackwood Creek, approximately 5 miles south of Tahoe City. The California Tahoe Conservancy purchased Eagle Rock and the surrounding 54.5 acre parcel in 1987 to provide public access, recreation, and opportunities for restoration of environmentally sensitive lands. When the Conservancy purchased the property more than 20 years ago, severely eroded user-created trails were the only means of accessing Eagle Rock. In many areas the trails had deepened to become gullies, trapping water, and routing sediment-laden runoff to Blackwood Creek, transporting fine sediment to Lake Tahoe. Immediately adjacent to Eagle Rock is the Conservancy’s Blackwood Creek Restoration Project. Expected to commence in summer 2012, the restoration project will improve riparian and aquatic habitat conditions, and channel stability and function along a section of the creek upstream from the State Route 89 bridge. California Tahoe Conservancy and California Conservation Corps crews constructed a new trail during the summer of 2011. The new trail is designed to maximize soil stability and user enjoyment, implementing advanced erosion control techniques to stabilize eroding areas and disperse concentrated water flows. The summit of Eagle Rock can now be reached in approximately 20 minutes using the new trail. From the top of Eagle Rock nearly all of Lake Tahoe comes into view. Improved parking is available off of State Route 89, immediately south of Eagle Rock. The Conservancy extends gratitude to the Tahoe Rim Trail Association and the U.S. Forest Service, Lake Tahoe Basin Management Unit for providing training and field assistance. The trail is open for public use. A kiosk provides on-site information. 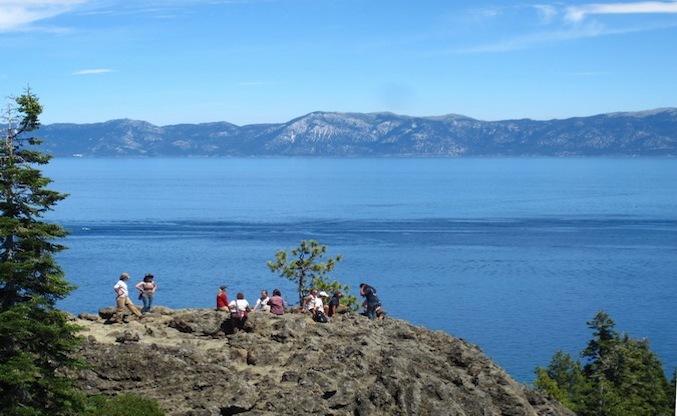 The view from the top of Eagle Rock offers panoramic views of Lake Tahoe. Dozens of large logs were hauled up the steep hillside to stabilize decommissioned trails, protect the new trail from erosion, and to deter trail users from cutting new trails. AmeriCorps Volunteers make trail improvements after the first few weeks of use.